Sometimes, when biology goes squirrely, it really goes squirrely. 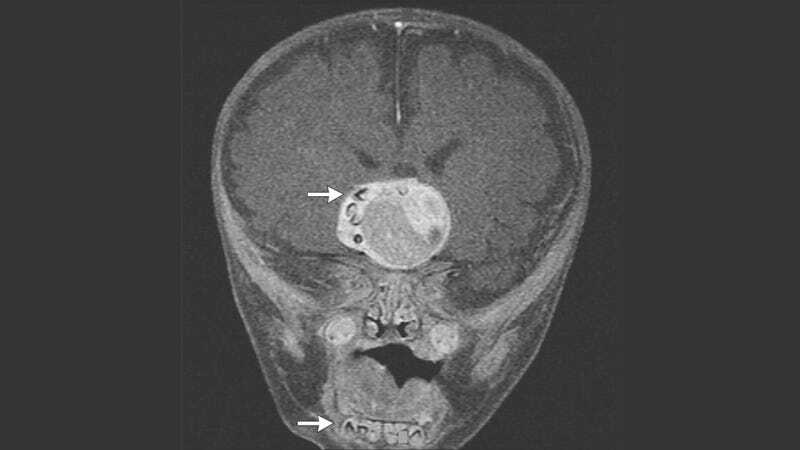 Case in point, a bizarre medical case in which a 4-month-old infant in Maryland was found to have several fully formed teeth embedded within a brain tumor. Warning: Graphic image to follow. The boy was admitted to hospital because his head was growing faster than normal. Subsequent MRI scans showed a “heterogeneous, enhancing suprasellar mass” — but it contained multiple structures along the right side that looked startlingly like teeth that form in the lower jaw. During the procedure to remove the tumor, the surgeons encountered multiple fully formed teeth. Fully formed! And not just bits of enamel or calcium deposits. “It’s not every day you see teeth in any type of tumor in the brain. In a craniopharyngioma, it’s unheard of,” Beaty said. Incredibly, the boy is doing well, but the tumor destroyed his capacity to release certain hormones, so he’ll have to undergo hormone treatments for the rest of his life.